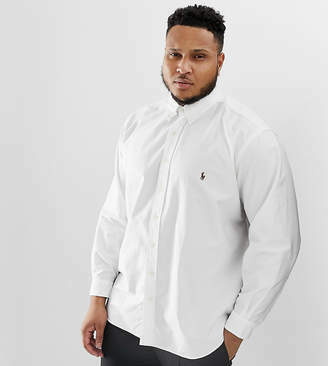 Big Tall oxford shirt by Polo Ralph Lauren, A go-to wardrobe addition, Button-down collar, Button placket, Embroidered branding, Curved hem, Regular fit, A standard cut for a classic shape. Naming his brand after a game that embodies classic style, Ralph Lauren created Polo Ralph Lauren in 1967 initially selling men's ties. Interested in longevity, timelessness and style, Polo Ralph Lauren has since grown into a complete collection of preppy polo shirts and accessories with a rich history of design.